Belgrade's tribute to the first man in space has been removed after less than a week, following an outcry over the size of its head. 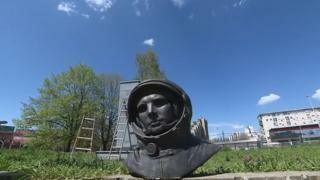 The bust of Soviet cosmonaut Yuri Gagarin, erected on the street which bears his name in the Serbian capital, was removed by workmen on Tuesday, B92 news website reports. Locals said that the tribute, placed next to a branch of McDonald's and facing a shopping centre, was an "insult" to the man who orbited the Earth on 12 April 1961. It featured a tiny bust of Gagarin on top of a tall plinth, which led to complaints that the statue was out of proportion. Belgrade City Manager Goran Vesic says that a new work will be commissioned, and would only go up after getting the go-ahead from "all relevant institutions", B92 reported. It transpired that the city had no knowledge of the design, and neither had the Ministry of Culture nor the foundation which had financed it. However, Mr Vesic said that this time Belgrade would get it right. "Gagarin will have a memorial in Belgrade worthy of the contribution that he has made to humanity," he said.